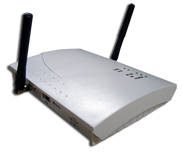 At 11Mbps these low cost access points are ideally suited for wireless Internet or point to point wireless bridge applications. bridge between two wired/wireless networks. and cables (all sold separately) is available at a discount price.